A friend of mine has given me a picture to show you all. It was taken in a property that had witnessed many inexplicable events. The property is now empty as the owners had fled in terror. The mysterious 'face' is between the second and third women from the left, about knee high. I think that a child is there. The floor is black instead of grey below the face. Since the face is below the path of light and in the shadow, it is possible that it is not a ghost. Otherwise, this is very interesting, but the photo bottom is cut short, so really...I would say...not a ghost but a child in the shadow. A child that is hanging on mommas leg, wearing black. Very good observation BluemountainTracker, Although my friend tells me there was no child present in the same location it certainly deos look like a normal child but in the shade, clinging on to its mothers leg. Hmmm, I've seen this picture on Youtube before...and it didn't have any black blocks that are blocking the people's faces. Though it isn't very visable in the picture posted here (since all of there faces are blocked), the little girl in the lower right corner is crying. And its said that a child can sense the presents of a spirit more than an adult can, so that can explain why she is crying. If there is any ghost of all, that is. You can take into consideration that it just can be a younger child clinging to her mother's leg in the shadow of the standing adults. 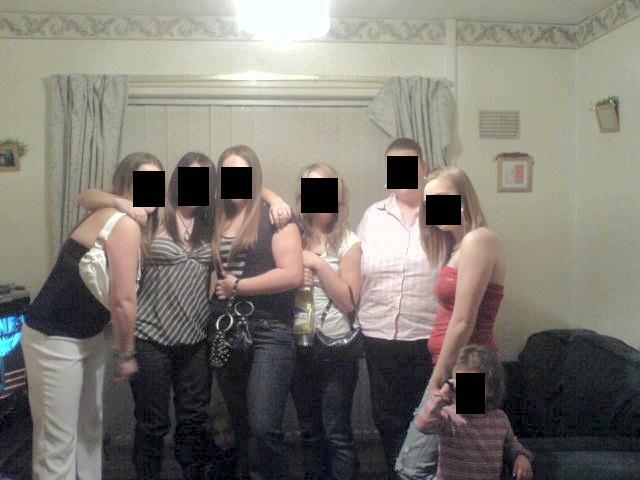 Though, it looks a little like the "child" is standing a little in front of the woman that is standing third from the left. Also, the face of the "Ghost" looks very dark and faded, a little too dark considering the lighting in the room. Though, this can be explained by simple CGI work. But still, its a very intruging picture that is still open to study.